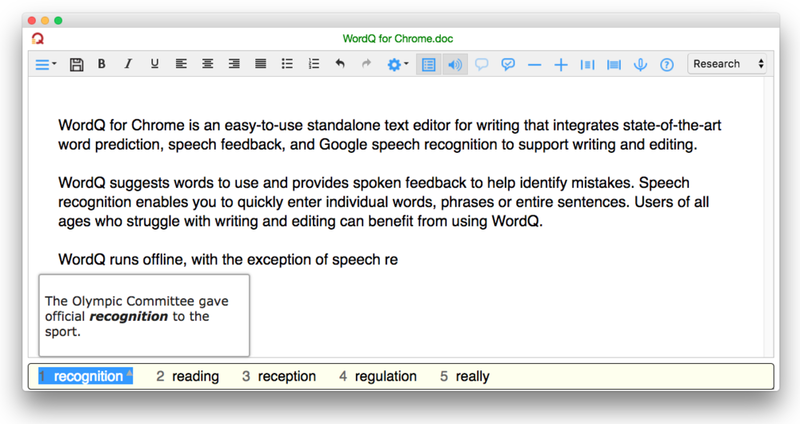 WordQ for Chrome is an easy-to-use text editor for Chromebooks with writing skill improvement and compensation tools. All students benefit, including English Language Learners (ESL), Second Language Learners (ELL), and struggling writers. WordQ runs offline, and you can open and save documents on your Google Drive (when online) or locally (when offline). The intent is not to replicate all the features of Google Docs, but to offer a much simpler supportive writing space for note-taking, initial drafts and editing with minimal formatting. Google Voice Typing is also supported with the added benefits of speaking recognized text and controlling the microphone. WordQ helps students create better quality written work with greater independence and ease, and with less stress. Intelligent word prediction suggests words appropriate for elementary and secondary schools (starter, intermediate, and advanced levels). Students write faster and produce more, and get help with spelling and grammar with as little as one or two keystrokes. By intentional design, with input from seasoned educators, WordQ does not write for students nor fix all their mistakes. They must still do their own writing but WordQ makes it easier to independently write more effectively. There’s no criticism and no pressure, so writing can be enjoyable.